This page contains information and frequently asked questions on the Radiation Therapy treatment process. While this information will not necessarily correspond to the exact process adopted by an individual hospital, we hope it will provide general background information and an indication of a typical treatment process. Radiation therapy is the treatment of cancer with radiation. This can be done in a variety of ways, depending on the nature of your cancer. The most commonly used method is called external beam therapy (from a machine outside the body), which directs radiation at your tumor. Although the radiation affects both cancer and normal cells, it has a greater effect on the cancer cells. Treatment aimed at cure will give the highest possible dose of radiation to the cancer area (within safe limits) to attempt to kill all the cancer cells. Sometimes smaller doses are used, where the aim is to reduce the size of a tumor and/or relieve symptoms. A specialist cancer doctor is known as a radiotherapist or radiation oncologist. In this guide we will refer to him/her as an radiation oncologist. The radiation oncologist will plan and oversee your treatment, which will be carried out by radiation therapists. In addition, the team looking after you may include nurses, health care assistants, specialist nurses, counsellors and dietitians, according to your needs during your treatment. Every course of radiation therapy is designed to suit the particular needs of the person receiving it, so you will usually be asked to make a preliminary visit to the treatment center to have your course of treatment planned. The radiation oncologist and radiation therapists will do this (in conjunction with x-rays and scans, using a machine called a simulator). Your skin will be marked with coloured pens to define where you will have your treatment. In addition, some minute permanent marks will be made using a special dye and a tiny pin prick. These marks will enable the radiation therapists to identify exactly the right area at every treatment session. If a head shell has been made for you the guidance marks will be put on the shell rather than on your skin. If you are having radiation therapy to your mouth and/or throat you will need a dental assessment at this stage as you may require some dental treatment before you start your radiation therapy. If you are able to travel to the hospital for treatment there is usually no need for you to be admitted during the course. Most people are treated as outpatients, but your radiation oncologist will tell you if it would be better for you to be admitted. Will I have any tests during treatment? During your course of treatment, you may need to have occasional blood test and/or urine test, depending on the part of your body being treated. Some people also have X-rays and/or scans during their course of treatment, which is part of the routine and nothing to worry about. Are there particular things I should or should not do during my course of treatment? Radiation therapy is given using either a machine called a linear accelerator or, for some skin tumors, a superficial x-ray unit. To receive the radiation therapy, you will lie on a couch under the machine, and be asked to remain still during the actual treatment. No. The treatment is completely painless. Radiation cannot be seen or felt while it is being given. Will the treatment make me radioactive? No. There is no possibility of this whatsoever. Your radiation oncologist will tell you this once the appropriate treatment for you has been decided. A course can last for anything from a single treatment to five treatments a week for six weeks depending on a number of factors, e.g. the part of your body being treated and the aim of the treatment. Most treatments are carried out daily between Monday and Friday. This varies from machine to machine. Some machines operate at a faster rate than others, and it also depends on the plan worked out for you. The length of a treatment session can be anything from five minutes to fifteen minutes. Occasionally a session may take longer, but this will be explained on an individual basis. When you come for your first treatment your radiation therapist will tell you how long each session will take. Drink plenty of fluids every day during treatment, e.g. tea, coffee, milk, fruit juice, water or fizzy drinks (ideally sugar-free). Eat regularly and try to keep a balanced diet. If you don’t feel like big meals, try eating little and often. The dietitian can help to plan a diet for you if necessary. Wash, shower or bath as normal during treatment using a simple or baby soap taking care to pat dry the area being treated, rather than rubbing it. Drink spirits, eat spicy food or very hot or very cold food if you are having treatment to your mouth, neck or chest, but ask the radiographers if you would like more information. 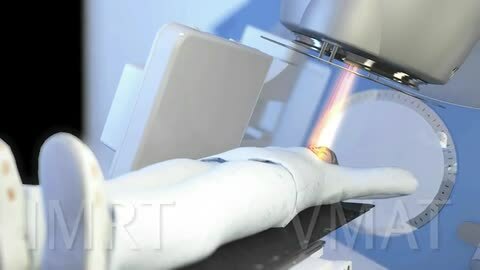 Expose the treated area to the sun during a radiation therapy treatment course, as the treated area will burn more easily and take some time to heal. In the future it is advisable always to apply sunscreen to avoid sunburn. Put creams or deodorants on the treated area as these may worsen your skin reaction. Am I likely to have any side effects? Sickness: Depending on the part of your body being treated you may feel nauseous or be sick during your course of treatment. This does not happen to everyone. If you do feel sick, please tell your radiation therapist or nurse as it can be controlled by tablets or diet. Diarrhea: Again, depending on the part of your body being treated, you may experience some diarrhea. Please tell your radiation therapist or nurse if this happens to you as you may need diarrhoea-relieving medication.The dietitian will also be pleased to advise you and help you with an eating plan if necessary. Frequency when passing urine: If you are having treatment to your lower abdomen/pelvis you may find that you pass urine more often and may experience discomfort when doing so. Drinking extra fluids will help, but try to avoid alcohol, tea and coffee as these can irritate your bladder. If this happens to you please tell the staff treating you, so that your urine can be tested for any infection,which could then be treated with appropriate medication. Sore mouth and throat: This only happens if you are having treatment to this part of your body. If it is likely to be a problem your radiation therapist or nurse will explain how to look after your mouth and throat, or give you advice on chewing and swallowing difficulties. This only happens if you are having treatment to this area. If it is likely to be a problem, your radiation therapist or nurse will explain to you how to look after your mouth and throat during treatment. Hair loss: Hair loss only occurs where treatment is given. For example you will only lose the hair on your head if your head is being treated, and if your chest is being treated, then you will only lose your chest hair. Whether or not it grows again will depend on how much radiation you have been given. Your oncologist will explain what this means for you. If your hair is expected to grow again, this should happen within a few months of the end of your treatment. If you feel you wish to carry on working, as long as your radiation oncologist reason why you should not continue with your normal daily course of treatment. However do ask if you need advice. What will happen when the treatment is finished? The immediate side effects of the treatment described above will start to ease off within a week or two of the end of your course. Because of the way radiation therapy works, the full benefit of the course of treatment is not usually reached until some weeks after the last treatment session. Will I have any check-ups after my treatment? After your treatment, you will be seen again at the hospital you first attended or be referred back to your family doctor. The first follow-up is often about 4 to 6 weeks after the course has finished, and this appointment will be discussed with you before you finish at the treatment center. However, follow-up arrangements can vary from person to person and from centre to centre. Your radiation oncologist will explain to you how and where your follow-up appointments will be arranged. Can radiation therapy cause permanent damage? Radiation therapy treatment is planned and delivered with the utmost care, but sometimes sensitive parts of the body are damaged. This is because to treat the cancer effectively, it is sometimes necessary to use high doses of radiation, close to the limits that normal tissues can withstand. The bowel, bladder and nervous system are particularly sensitive, but other parts of the body can suffer long term changes. If you are having radiation therapy aimed at killing your cancer cells, there is about a 5% possibility of side-effects which may seriously affect your lifestyle. However, it is important to balance this against the much higher potential risks to your life, from the cancer getting worse or recurring without the treatment. On the other hand, if you are having radiation therapy to shrink the tumour and/or relieve symptoms, then the much lower doses of radiation used are unlikely to cause any permanent damage. If the radiation therapy treatment includes the gonads (ovaries in women, testicles in men) this will affect fertility and hormone function. It is important to discuss this with your oncologist before treatment begins. If you do have any difficulties at any time in the future which you feel may be connected with your radiation therapy, then do not hesitate to contact your oncologist or GP. If there are any special risks or problems in your case then your oncologist will discuss this with you. Bear in mind that you are being offered radiation therapy because the benefits greatly outweigh the risks. 14.1 million: The number of new cancer cases diagnosed in 2012 worldwide. More than half of these – 8 million – occurred in economically developing countries. 1,676,600: The estimated number of new breast cancer cases among women worldwide in 2012. Breast cancer is the most common type of cancer among women in both developed and developing countries. 163,300: The estimated number of new cancer cases diagnosed among children aged 0 to 14 worldwide in 2012. About 80,000 children worldwide died from cancer in 2012. “Mortality rates are lowest in developed countries, despite higher incidence rates, because of the availability of high-quality diagnosis and treatment,” the report states. 8.2 million: The number of cancer deaths in 2012 worldwide. 1,241,600: The estimated number of new lung cancer cases among men worldwide in 2012. Lung cancer is the most common type of cancer among men globally. When looking just at developed countries, though, prostate cancer is the most common among men.